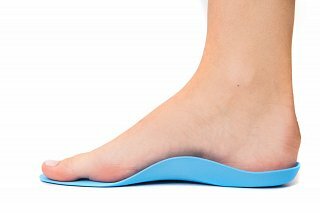 How orthotics help with the management of knee, hip and back pain. In Fermoy here in Ireland, there used to be a wonderful cobbler, Mr. Kane with his shop on Patrick Street. When repairing his customers’ shoes, he looked at how the sole of the shoe had worn and then would sometimes provide a wedge to wear inside them. In fact, he was famous for his wedges and many people reported that they helped with their foot, knee, hip and even lower back pain! What Mr. Kane understood was that poorly aligned feet can cause wear and tear to your body as well as to the soles of shoes. From a medical perspective, ‘Fallen arches’ or ‘flat feet’ often disrupt normal knee function and hip alignment. This can also cause strain on muscles in the lower limbs and back, leading to a wide range of common complaints. That is why, when treating conditions such as lower back pain, we sometimes we start at the feet. If the foot is properly supported, then the ankles, legs and knees can revert back to their natural alignment and ease stresses in the lower limbs and back. One of the ways we can achieve this is through orthotics - customised insoles that are easily inserted into your shoe. Have pain in the ball or heel of the foot. Have corns, callous or bunions. Are prone to shin splints or groin strains. Get ankle pain after walking or running. Get knee or hip pain after walking or running. Have chronic or permanent lower back pain. Are likely to develop any of the above. Firstly, it’s best to get a biomechanical consultation with a Chartered Physiotherapist (or a Podiatrist) with a qualification in Biomechanical Assessment. They have the training and experience to determine whether you need biomechanical correction in the first place. Secondly, remember that wearing orthoses takes commitment - you put them into every shoe you wear, and you have to wear them all the time. If you don’t your biomechanical alignment will stay in a state of change, causing injury. So, be sure to get the correct type of insole for your feet and wear them properly. Many physio clinics will stock customisable EVA insoles, which are temporary devices. These are good quality customisable inserts that typically last up to a year. In many cases, EVA insoles are as effective as the more expensive moulded products, provided they are regularly checked and replaced when they eventually expire. You can get also more expensive carbon fibre orthotics that are moulded to your feet, which last longer and are more comfortable to wear.